Today, two-time Grammy-nominated duo ODESZA announced their A Moment Apart Tour Finale at Los Angeles State Historic Park on Saturday, July 27. The event will be ODESZA’s last performance of their acclaimed A Moment Apart show before going back into the studio to begin work on their next chapter. Starting today, fans can sign up here to receive an exclusive presale code. The presale begins Wednesday, March 27 at 10:00 AM PT, with the general public on sale beginning Friday, March 29 at 10:00 AM PT. Foreign Family Collective, the record label formed by ODESZA’s Harrison Mills and Clayton Knight in 2015, will be featured prominently at this historic show. Former FFC signee and current Counter Records label mate Big Wild will support ODESZA, preceded by Foreign Family artists EVAN GIIA, MEMBA, and ford. More information available at amomentapart.com. ODESZA’s critically acclaimed third album, A Moment Apart, marks the next step in the evolution of production duo Harrison Mills and Clayton Knight, who have been making music together since their college days at Western Washington University. They began their meteoric journey in 2012 with Summer's Gone, an album they completed near the end of their tenure at Western. It was followed by 2014's In Return, which debuted at the top of Billboard's Dance/Electronic charts and featured gold single "Say My Name." A remix of the track by RAC was later nominated for a Grammy in 2016. In the course of that five-year span, they've gone from ground zero to selling out large arenas, all without the benefit of mainstream press or radio airplay. They've built their appeal through word of mouth and streaming, plus a unique live presentation featuring an 11-piece ensemble that includes a horn section and a marching-band drumline. A Moment Apart moves into expanded sonic and psychic territory, seamlessly balancing organic and layered synthetic sounds, creating a dreamy, often stirring hybrid that owes as much to Motown and '60s surf music as it does to electronic forebears such as Four Tet, M83, Gorillaz and Bonobo. Mills and Knight have always been leaders in the revolution of indie electronic music, encompassing a wider, more melodic musical palette and incorporating their own instrumental expertise. 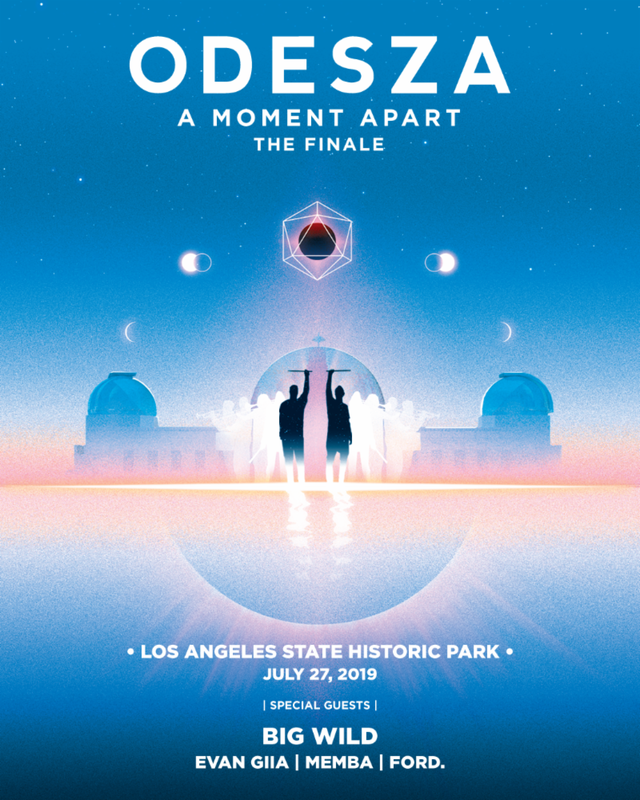 On A Moment Apart they take their eclecticism one step further, using a stellar range of singers, including Regina Spektor, Leon Bridges, and RY X.
Don’t miss ODESZA: A Moment Apart Tour Finale with Big Wild, EVAN GIIA, MEMBA and ford at Los Angeles State Historic Park on Saturday, July 27. Los Angeles State Historic Park is located at 1245 N. Spring Street, Los Angeles, CA 90012. Tickets On Sale Friday, March 29 at 10:00 AM PT! For more information on ODESZA, please contact Josh Page (jpage@shorefire.com) at Shore Fire Media, 718.522.7171.